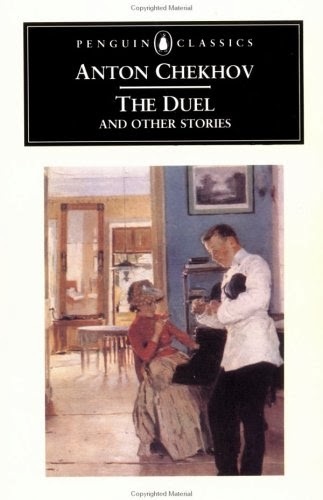 I'M done with the Garnett translation of The Duel and Other Stories. Anton Chekhov writes simply and beautifully. People in the medical profession are often featured. He's an easy read: a writer's writer whose sentences pack more punches than other authors' paragraphs. I love him. So now, let me share my notes, lest I forget the stories entirely. With a preoccupied face she touched the jelly with a spoon and then began languidly eating it, sipping milk, and he heard her swallowing, he was possessed by such an overwhelming aversion that it made his head tingle. These voluptuaries must have in their brains a special growth of the nature of sarcoma, which stifles the brain and directs their whole psychology. Afterwards, when he got home, a strange, long, sweet day began for him, misty as forgetfulness. Mire (full story) is about two men's secret getaway from the stresses of life: the house of a Jewess, an impossible woman but who captivates both of them in ways they cannot explain themselves. Neighbors (full story) is about Pyotr Mihalitch who seeks out her sister. She has eloped with an older man named Vassilitch. 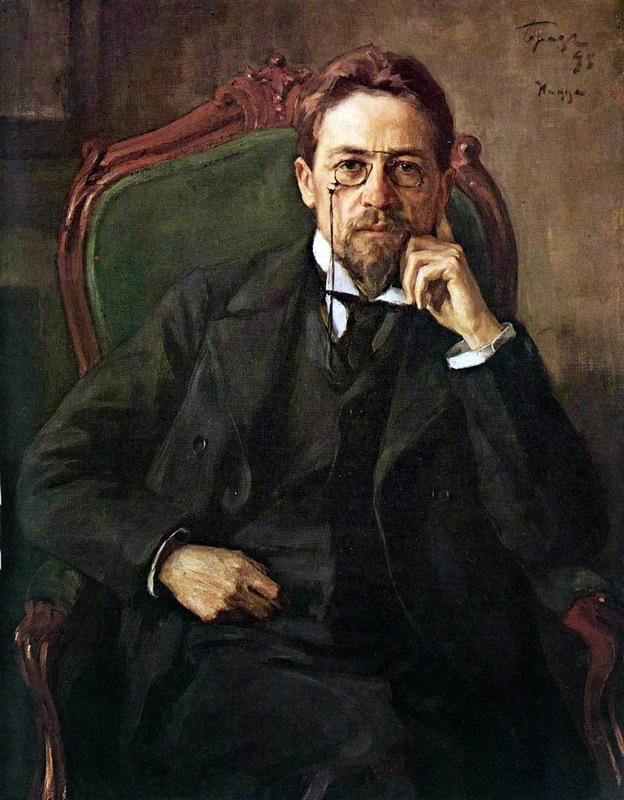 Just as the reader is bound to come up with a harsh judgment against this immorality, Chekhov ushers in Vassilitch's story, not to excuse his behavior but to explain that there is an underlying motive for it other than lust. Vassilitch himself has been wounded by love. His first wife had left him. She had been cheating on him all along: "She led a bad life, you understand, and you are the only one of the neighbors who hasn't been her lover." Falling in love with Pytor's sister is the great thing that's happened in his life. Pyotr Mihalitch rode along the bank of the pond and looked mournfully into the water. And thinking about his life, he came to the conclusion that he had never said or acted upon what he really thought, and other people had repaid him in the same way. And so the whole of life seemed to him as dark as this water in which the night sky was reflected and water-weeds grew in a tangle. And it seemed to him that nothing could ever set it right. Excellent prose, don't you think so? But so, so sad. My favorite in this collection is At Home (full story). Vera Ivanovna Kardin is a young woman who has finished university and whose father has just died. She goes to home to her grandfather's estate, an isolated steppe far away from the city, to make a life of her own. As she leaves the train, she is fetched by a carriage. All at once she is taken back to memories of her childhood, for the last time she'd been here was when she was still a child. She murmurs, "Lord, grant that I may be happy here." She welcomes the isolation and solitude at first, but she finds herself bored—similar to the boredom experienced by a medical student after months of taking the year off from school. How to while away the time is her greatest problem. The space, the lovely peace of the steppe, told her that happiness was hear at hand, and perhaps was here already; thousands of people in fact would have said, "What happiness to be young, healthy, well-educated, to be living on one's own estate!" And at the same time the endless pain, all alike, without one living soul, frightened her, and at moments it was clear to her that its peaceful green vastness would swallow up her life and reduce it to nothingness. She is being paired off with Neshtchapov, a handsome, charming man who bores her. He falls in love with her. With nothing else to do she decides to marry him. Expensive Lessons (full story) tells the story of Vorotov who hires a Frenchwoman to teach him how to speak, well, French. He feels strongly attracted to her. Her beauty distracts him. In the end he doesn't learn French at all. The story reminds me of when I was in college. My friends and I used to have a crush on our Math professor. Instead of being distracted, we all got high grades in her class. In The Princess (full story), a contemptible aristocratic lady visits a monastery. In writing about this princess, Chekhov paints an irritating picture of a narcissistic woman. One cannot help but feel annoyance at the very description of her. It is a doctor, Mihail Ivanovitch, who shows her how bad a woman she is. In the end she still thinks highly of herself. One cannot change a person who doesn't feel the need to change at all. The Chemist's Wife (full story) is about the young, lovely wife of a pharmacist who, being bored with her life, hosts of party for random customers while her husband is asleep. 1. Doctors figure a lot in the stories. 2. There are many allusions to the medical profession. 3. The stories are short but stinging. 4. The names—you'll be fascinated by the mere mention of the Russian names. 5. And lots and lots of depression, which is so Russian, when you think about it.